My natural tendency is to save things...too many things. What if I throw one of the girl's pictures away that they colored and the very next morning they ask me where it is? What if I suddenly decide that that pink sleeveless top I haven't worn in over a year is the very thing I need to complete an outfit because it is suddenly the most awesome color in the world...despite the fact that it is an ill-fitting top? I certainly can't throw that bottle of lotion out that my grandmother gave me for Christmas last year. I mean, it was good lotion. What if the world suddenly stops producing smelly lotion, or I have an epiphany and actually start using it. I'll be so sad when I need that and realize its gone. I can't throw these pieces to this plastic fishing game away, even though the game is completely unusable right now because Aubrey jammed something into the motor of it. What if I suddenly figure out how to fix it? What if I throw it away and the girls' childhoods are tainted because they LOVED the game, because their grandmother bought if for them, because it was the BEST toy EVER?! Yes, yes, these are the questions and thoughts that go through my head when I pick up random pieces of "stuff" around my house and deliberate the value of it. Should I keep it or get rid of it? If I get rid of the item should I donate it, or throw it away? If I keep it, is there a better place to store it? Do I need to organize it all in a different way? Sometimes it's just easier to stuff something in a closet, or a drawer, or a folder to deal with later. There are too many questions to ask, too many options to consider! Until all of those sometimes start to add up to something big. Until all of your "sometimes" start to becoming overwhelming because there are so many to deal with. 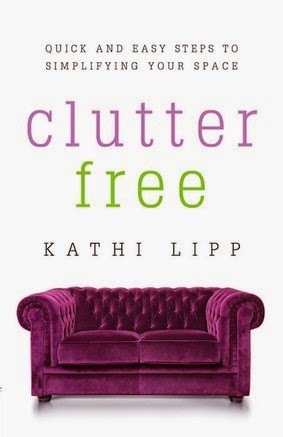 Before I started reading Kathi Lipp's new book Clutter Free, my tendency was to keep such things, mostly because it was the easier emotional response at the moment. If I didn't know what to do with something it was easier to stuff it into a bin, or a basket or a closet and not deal with it. It basically amounts to procrastinating. Basically. You are pushing off the responsibility of needing to do something or make choice about something until a later time. Except that time often never comes, and your storage places, that have become hiding places (or procrastination spaces) are no longer useful and functional and you start to feel like you need a bigger house, or more storage, instead of realizing what you just might need is less stuff. Our house is an average size house. Its' around 1,950 square feet and has four bedrooms (they're not huge, but there are 4). It's a nice, functional house on a quiet dead end street. The backyard is a little small for my liking, the functional kitchen space is not ideal, and given that my husband works from home it would be nice to have a finished basement for him to work in (instead of a cluttered chaotic space). With three girls we also cringe at the idea of having to share a bathroom upstairs with them as they all get older (we have one an half baths--one shower). But, all those things aside, I grew up in a 1,300 square foot ranch with six people (my parents, myself and my three siblings) three bedrooms and no basement. Somehow we all made it out alive! 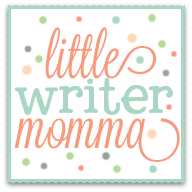 So, when I really start to think I need "more" (as in more house), I've been trying to remind myself that what I really may need (for now anyway), is "less" as in less stuff. After being encouraged by this book I'm throwing things out with confidence. I'm saving the important things and getting rid of the rest. I'm not letting undue guilt or fear prompt me to keep things that are not valuable or that we are not using anymore. I've snapped a few more photos of my de-cluttering journey. My imperfect decluttering journey. To be honest, the progress has been good, though not as fast as I would like it to be. It's kind of like wanting to lose weight and finding that the reality of the situation is that you often only lose a pound or two a week, not 10 pounds overnight. I'm making slow progress over here. We're getting rid of a few things everyday. A lot of things somedays. Life marches on. The kids bring home more papers. Aubrey pulls every game out of the window seat and dumps it on the floor in the seven minutes that I had hoped to sneak away and unload the dishwasher. 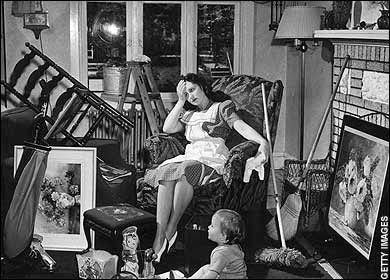 Immediate messes must be cleaned up on most days before I can even consider working on the "cluttered" hiding spaces. But I'm being optimistic because I feel like my attitude and perspective on all of this has changed, and sometimes that is the most important part of the equation. If you come to my house you might still see a lot of "stuff", but you should know that there was much more! And that in the few moments I have here and there I will empty out a drawer or a closet or a cabinet and just start flinging things into trash bags...and it feels really good! Here are a few photos of some recent decluttering moments. This is the bathroom closet after decluttering. I threw away a bag of stuff that weighed over 16 lbs! Here's that 16 lb. bag. It is FULL of unused bubble bath, soap and shampoo samples, perfume I haven't worn in 8 years, broken razors, and 1/2 used bottles of shampoo that no one really liked, but that I felt guilty throwing out because I spent good money on them! One of two "random stuff" kitchen drawers. Random stuff kitchen drawer #2. I should have taken a before picture, but didn't. Just know that it was ugly. A box of books and DVD's that I've donated to a friend for her summer yard sale. She gets to keep any money made, I get the stuff out of my house! A total win-win! The kind of stuff that I'm getting rid of these days that I used to hang onto. Plastic rings, McDonalds toys, Barbies with missing clothing and frizzy hair that no one plays with, etc. And this stuff!! Random game pieces to toys that I keep intending to fix!! The truth is, I don't have time and they can't be fixed right now, so if the girls really love the game I'll buy a new one in the future. For now, so long game pieces! So, there you have it. I hope my throwing away spree encourages you to throw some stuff away too! It really is very freeing and is beginning to help me feel like I am in control here and that the "stuff monster" really isn't going to come alive one night and swallow us all whole like it can sometimes feel is going to happen. Stop back next week! I have an extra copy of the book to give away! I have benefitted from it so much that I bought an extra copy to pass along to one of you. I'm going to write one more post about all of this decluttering business with a few of my favorite quotes from the book and a few more photos of some slightly more organized spaces. In the meantime, if you'd like to check out the book or order a copy for yourself, you can find it on Amazon here. 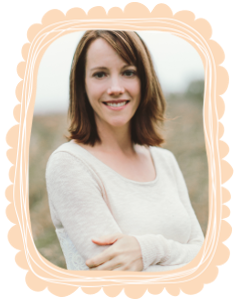 Also, pop over to Kathi's website and sign up for her 21-Day Clutter challenge. There is a link to her site here. 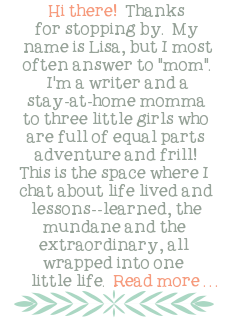 Great work Lisa! I'm sure it feels so good to be making progress. I'll have to show you my clutter corner tonight.